The Bee Man is your Lake Forest bee removal expert. We have provided bee removal and bee relocation services to Lake Forest residents since the mid-1970’s an continue to be very active in the community today. Knowing more about the history of Lake Forest may help you understand how bees can thrive in this city. Once known as El Toro, Lake Forest was an agricultural community until residential, commercial and industrial development began in the mid-1940’s and 1950’s. In the 1960’s, Occidental Petroleum decided to create a master-planned community around the area’s abundant eucalyptus trees and man-made lakes. As a result, this development gave the community its name “Lake Forest”. In 1991, Lake Forest was incorporated as a city. Today, Lake Forest has a population of approximately 80,000 people. On average, there are 279 sunny days per year in Lake Forest, California. The July high is around 85 degrees. The January low is about 47. This weather climate is perfect for bees to thrive in therefore making bee removal in Lake Forest a very busy year-round service. Most bee swarms will find an ideal location to build their hive pretty easily throughout Lake Forest because of all the eucalyptus trees, an abundance of water in the lakes and mild temperatures. Therefore, Lake Forest may experience bee swarms more often than other cities. Although bee swarms will only last up to a few days, they can be intimidating. Furthermore, when bees build a new hive near homes, most residents feel a bit of fear or stress knowing a beehive is so close. Consequently, we’ve made a Bee Safety Tips page to inform you how to keep you, your family and neighbors safe from bees. 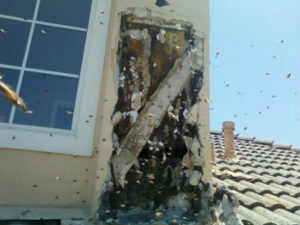 Should you need bee removal services, please contact The Bee Man right away at (949) 455-0123.